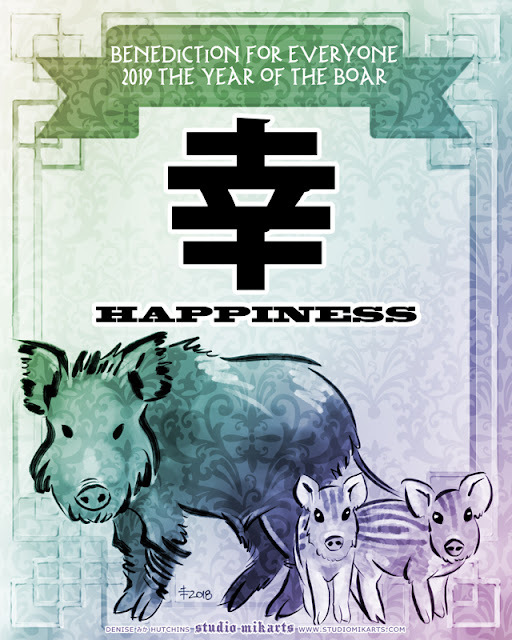 For 2019, I wish you happiness! Click hear to learn more about this piece. Hey everyone, happy new year! I'm recovering from the flu right now, but I wanted to start the year off right by making a little blog entry on the very first day of 2019. I have big plans for this year, most of which revolve around my return to college! Spring semester starts on the 14th and it's going to be the first time I've ever taken a full-time course load. I'm excited! I've always loved school, so being a full-time student is going to be really fun and satisfying. Outside of that, I'll continue making illustrations and creating rewards from them for my Patreon supporters throughout the year. I also figure that I'll have plenty of new artwork to choose from, so I'll participate in the Western Idaho Fair fine art exhibition again, and perhaps other art shows that are a good fit for my work. These things are what I'll definitely be doing, but a year is a long time, always ripe with new opportunity, so what I'm looking forward to most in 2019 are all the unpredictable things that will come my way! May 2019 bring us all the strength, ferocity, tranquility, and protection of the Boar! 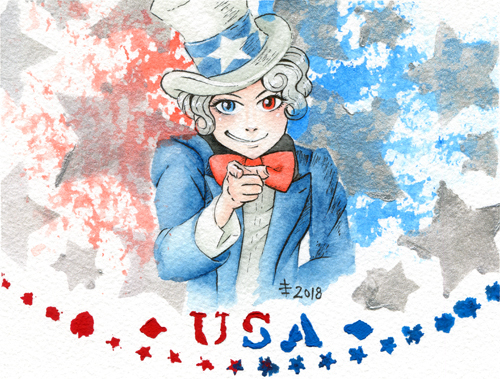 Aunt Sam - Happy Independence Day 2018! 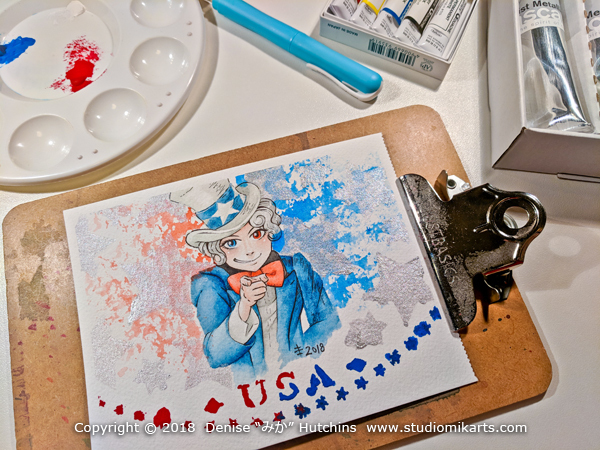 Happy Independence Day from me, here, in the United States of America! I was inspired to create something fun and unique today, since the holiday falls on a work day! Please allow me to present Aunt Sam! graphite, watercolor, gouache, acrylic, and ink on watercolor paper, 5x7"
I wanted to genderbend our well-known fictional representative and make her a cheeky, fun-loving lady (as opposed to the grump on the Army recruitment poster, lol). I don't know where the idea came from, but once I thought of it, that's all I wanted to do for my 4th of July Twitch stream. 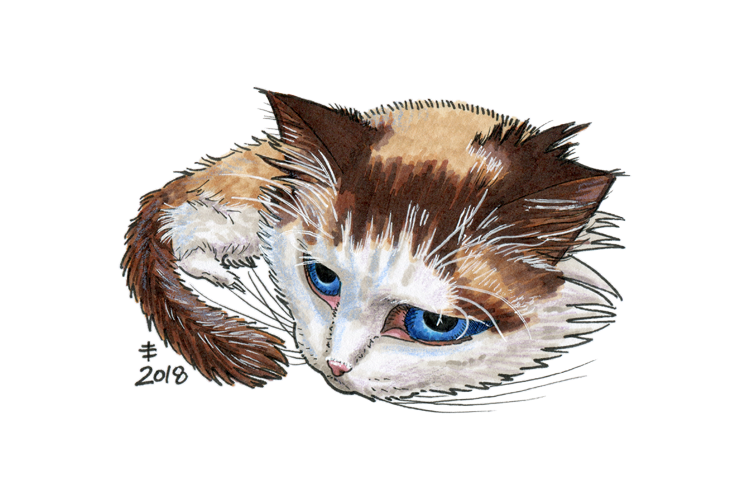 I think more than anything, the fact that this would give me a break from my February Gryphon illustration, which I've been working on diligently every day for the past few weeks, was what motivated me. I ended up using an even wider variety of media than I originally planned. My plan evolved as I worked and after finishing the graphite sketch and the watercolor, my use of the gouache with a stencil proved that I would need to use something else when adding more detail to the background. I had intended to use gouache there too, but it was too bold and would have taken away from the main focus of the piece (Aunt Sam, that is). So I switched to metallic silver acrylic! I love the effect! I definitely think it was the right move. Everything else went as planned and I finished off the details with ink and more gouache. Real time creation video of Aunt Sam 2018. 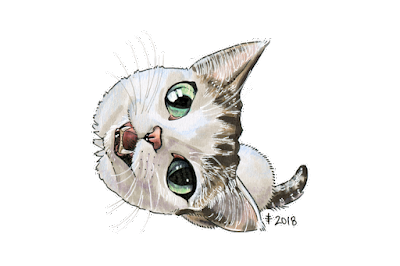 Today I'd like to share a chibi I drew for myself, as a response to an art challenge posted by my friend on my message board back in April 2017. The challenge was to draw something from one's first anime. When I thought very hard about it, I realized that, technically, my first anime was The Hobbit! Although it is a Rankin/Bass film, the animation was done by what would eventually become Studio Ghibli. 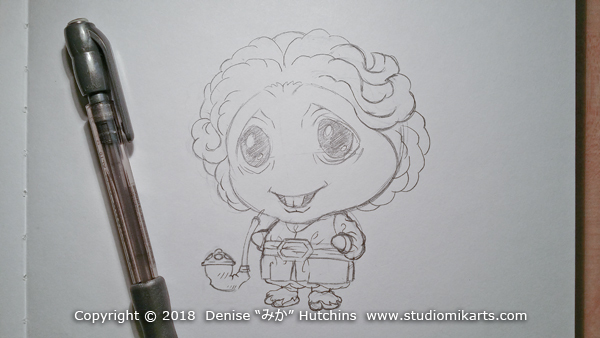 So, to complete the challenge, I drew the cutest Bilbo Baggins I could! ink and Manga Studio, 4x5"
I've always loved the incredibly unique art style of the animated The Hobbit adaptation (as well as that of its sequel, The Return of the King). 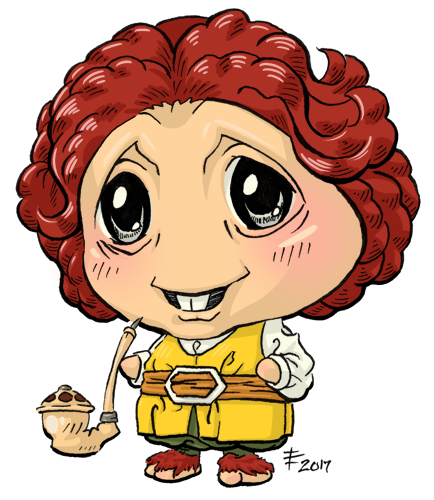 It was very fun to take that amazing style and process it through my own chibi style to come up with this super cute Bilbo! 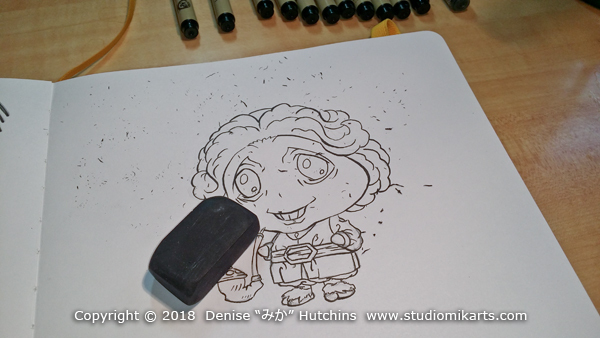 I started by finding a good reference image from the movie and then began sketching. I used my Sakura Micron pens to ink. I may have used a small brush pen of a different brand as well, but I honestly can't remember anymore, lol. I cleaned it up and got it scanned in and digitized for coloring on my PC but, again, for whatever reason, I totally forgot about the project and didn't start coloring it until nine months later!! My digital working environment with reference and color swatches. What got me to finally pick this project back up was my need for digital work to do during the months when I was in-between homes earlier this year. I was extremely fortunate to be in a place where I could stream art on Twitch despite my awkward situation, but digital was MUCH easier to do since I had a rather small workspace. That's how I dug this file back up and finished it off! You can watch the whole thing happen in the video below! 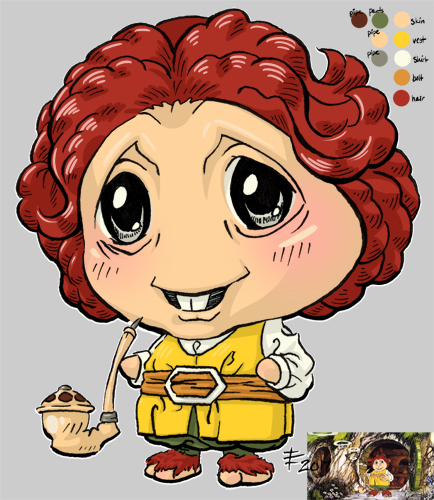 The coloring of Chibi Bilbo in real time. 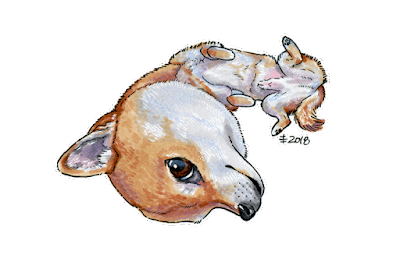 This year I did something I'm actually surprised I never have before: drew all my pets in chibi form! Pet caricatures are something I've done here and there in the past, but this year I've been taking it to the next level, promoting this artistic service as an inexpensive way to obtain custom artwork in my unique style. So, who better to model for this product than my own precious fur babies? 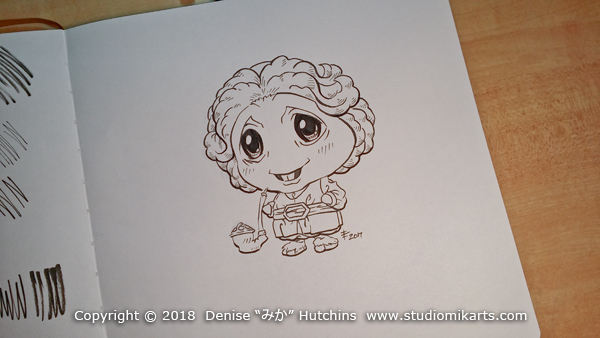 Another reason I drew this set of chibis was because I needed subjects for the weekly themed drawing I started doing for my Twitch livestreams, Chibi Friday. 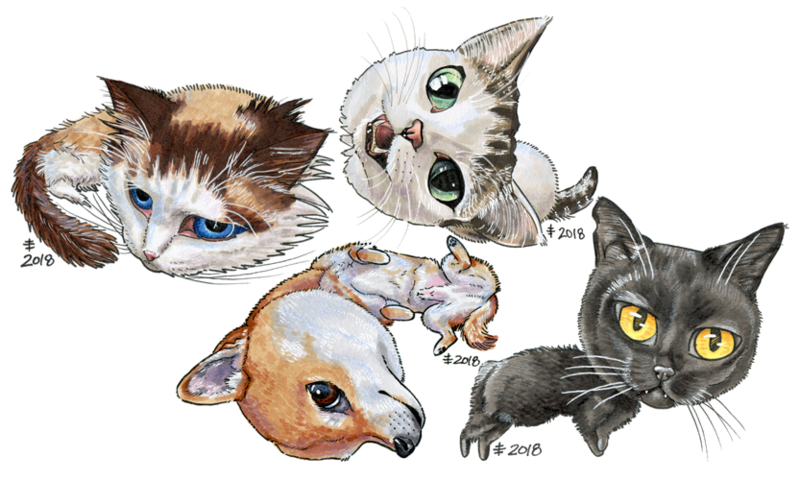 I wanted to avoid too much fan art and everyone loves animals, so I figured my pets were a great subject that anyone could enjoy (^^) Each of these drawings took about two hours to draw, give or take, so they were also the perfect fit for my standard streaming window! ink, marker, colored pencil, 4x6"
The first pet I drew was my black Manx, Kiba. I don't know why I decided on this, but I started with him because I wanted to draw everyone from smallest to biggest. The reference photo I used showed him laying on the floor on his side, looking up at the camera. I'm not sure if that comes across here without a background, lol. Here's the video of Chibi Kiba's creation! 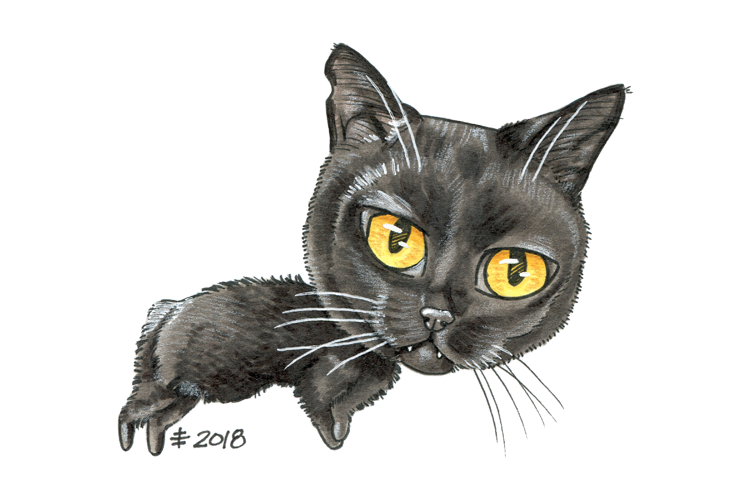 Next, as the second smallest pet in the house, I drew my cat Kiki. Her full name is actually supposed to be Tanuki because of her adorable striped tail, but that name was very quickly shortened XD For her chibification, I chose another unusual pose as reference. I wanted to challenge myself to draw chibis in positions that I never have before. So she's sitting on the floor, looking straight up at the camera, in her reference image. ...and this is part two! Next on my list was Bear, my second largest pet and the biggest cat. He's also the oldest pet! If I remember correctly, Bear's reference image was unique among this series because I took it right before I started drawing. We had only just got his weight back to normal after years of trial and error so I wanted to draw him looking his healthiest (^^) He wasn't very amused by my picture-taking so that's why he looks kind of annoyed in the drawing, lol. Finally, the last pet in this series, and the only dog, is my Shiba Inu, Sun! His name is pronounced "soon" like the Chinese surname (I named him after the Sun clan in Dynasty Warriors and Sun Wukong, the monkey king X3). His might be the most difficult pose I took on but I'm extremely pleased with the result! In the reference image, he was laying upside down in a recliner, lol. And here is the creation video for chibi Sun! 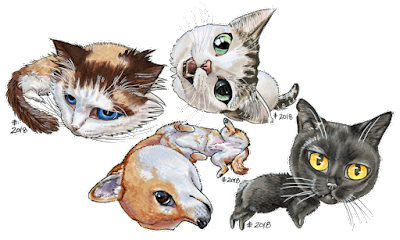 So that's everyone, three cats, one dog, Kiba, Kiki, Bear, and Sun~ If you'd like me to chibify your pet, or even your favorite animal, I am always open for these quick projects! Just email me at Denise.Mikarts@gmail.com to get set up!